Mat sewn from denim jean scraps and colorful scraps of cotton. Center the cardboard template on a print circle and mark the point where each of the four corners touches the outside edge of the circle. Use these marks as a guide, and stitch the print circle to a denim circle diagonally, wrong sides together. Repeat for each of the twelve circles. 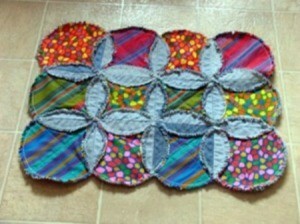 Fold the edges of the circles over between the diagonal stitching and press to make flaps. Stitch the flaps flat to each circle, excluding the very outside edges. Sew a double line of stitching around the outside edges of the mat. Snip the edges about every 1/4 inch up to the stitching lines. Washing and drying the mat will then rag the edges. I love this recycling idea. I just cut up an old denim skirt last night. Thanks for sharing! This is really neat. Can I ask what you are using the mats for? I'm making a quilt using the same technique. I almost have all the fabric and jeans cut!